Soil compaction is rearrangement of soil particles and reduction in macro-porosity and total pore space by stresses. Stresses can be external such as those from machinery or internal from increasing pore water suction during drainage and drying. The main cause of subsoil compaction on agricultural soils is cropping machinery, especially heavy air carts, harvesters and chaser bins. Other stresses may come from tillage, stock trampling and overburden pressure. Compact soils restrict crop and pasture production and increase nutrient leaching and emission of greenhouse gasses. Compaction is the change of a soil volume by compression and shear forces to increase bulk density and decrease porosity - the air is squeezed out of larger soil pores. Shear forces are caused by the traction forces of wheels, hooves and tracks and mainly confined to the surface soil. Compression forces affect surface and subsurface soil and have the greatest influence on soil that is moist and soft. Compression: Packing together of soil particles by relatively vertical forces, for example, under wheels tracks or animal feet. Shearing: Deformation of the soil mass, resulting from opposing horizontal forces, such as under spinning and slipping tractor wheels or hooves and implements such as ploughs. Smearing: Realignment of soil particles in a thin layer from random to parallel orientation under the base of mouldboard ploughs and spinning wheels (extreme shearing). Compression and shearing do the most damage in moist soils. They have the greatest effect on soil macropores, which are usually filled with air in unsaturated soils and are therefore easy to compress more easily than smaller pores. As the water content increases towards saturation, the pores are filled with water rather than air. The water has to be squeezed out to cause compression, but water is essentially incompressible at atmospheric pressure. Then soil becomes more resistant to compaction, but begins to flow and shear. On the other hand, dry soils resist compaction because of their interparticle forces, including water films, internal friction, fibres of organic matter and bonding with temporary cements. 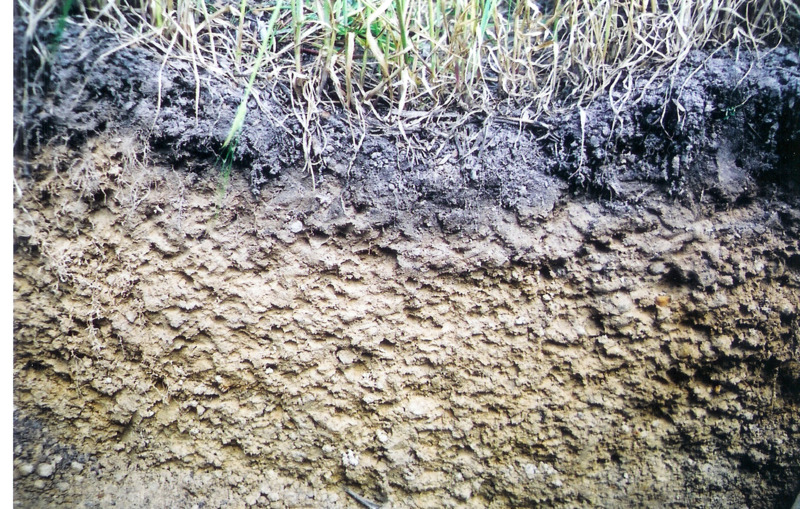 Stock trampling is a significant cause of compaction, especially in the surface horizon of finer textured soils, but effects are confined to the upper 15cm of the profile. Plough pans are caused by repeatedly tilling the soil at a constant depth for many years. Tillage implements such as tines, discs and mouldboard ploughs can smear and compact the soil immediately below their operating depth, especially at soil water contents above the lower plastic limit. Plough pans are characterised by an abrupt boundary between the tilled and compacted layers and there are often signs of smearing on the surface of the compacted layer. This often has a platy structure with a horizontal orientation, while the soil below is less dense. Plough pans form mainly in soils with medium to fine textures (that is, sandy loams or finer). Traffic pans are layers of high strength caused by compression of the soil by traffic. They are deeper than plough pans, with the layer of maximum strength at 10-40cm or more or more as surface loads increase. Traffic pans are common in soils with a coarse to medium texture (that is, sands to light sand clay loams).